This super simple four ingredient crockpot recipe is so delicious and flavorful. Serve over hot cooked rice, pasta, or couscous. In response to the 'very sweet' comments, I added a couple of tablespoons of apple cider vinegar the last time I made this, and my family loved it! In 3-4 quart slow cooker, arrange chicken pieces. Mix remaining ingredients in a medium bowl and pour over chicken. Stir to coat. 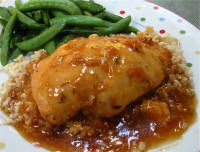 Cover crockpot and cook on low for 6-8 hours until chicken is thoroughly cooked and tender. If you like, you can thicken the mixture before serving. Combine 2 tablespoons cornstarch with 3 tablespoons water or chicken stock and mix until smooth. Add to the crockpot; turn to high for 10-15 minutes until sauce is thickened. Serve with hot cooked rice or pasta.